Three years ago, during the annual Doors Open Toronto, I had the opportunity to go on a guided tour of the Flatiron, also known as the Gooderham Building, located on the wedge shaped corner of Wellington East, Front, and Scott Streets. According to the tour guide, it is one of the most photographed structures in the city, mostly due to its unique shape. It now houses the posh offices of several companies, allegedly with the highest prices per square metre in the city. 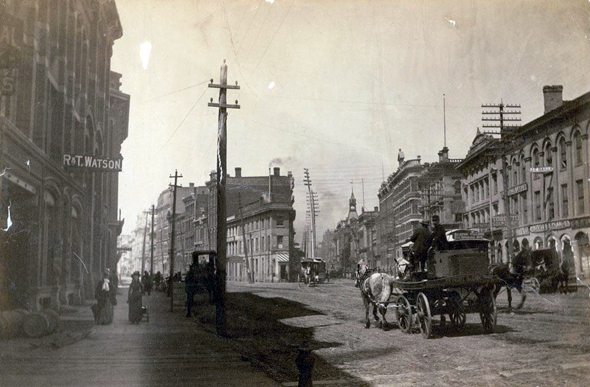 Before the Gooderham Building was erected in 1891, the corner was occupied by the so-called Coffin Block, and it was the site of Wellington Hotel, which served as the western terminal of the Kingston-York stagecoach line. 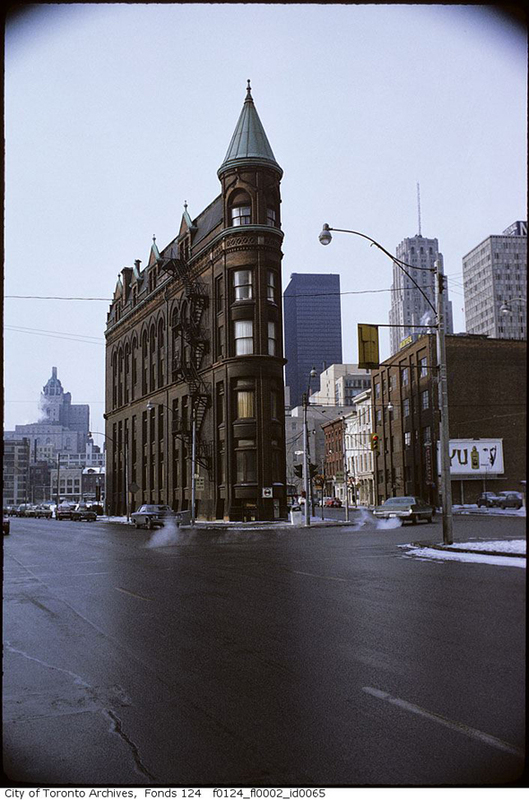 Bruce Bell and Elan Penn write in Toronto: A Pictorial Celebration that the the Flatiron was designed in the Romanesque Revival style by David Roberts Jr., whose father, also an architect by profession, had constructed the Gooderham and Worts Distillery. The structure is named after George Gooderham (1830-1905), the owner of the above mentioned business, which he had inherited from his father. 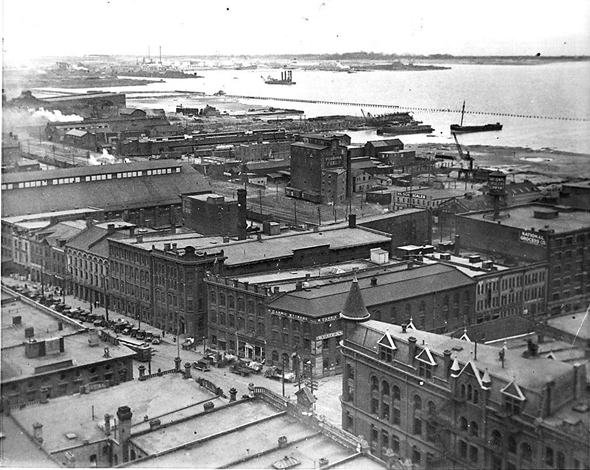 In addition to the distillery, Gooderham's business holdings included the Toronto and Nipissing Railway and Manufacturers Life Insurance Company. In 1882, he was appointed as the president of the Bank of Toronto, of which he was the founder. By 1890, the head office of the bank, located at the corner of Front and Church Streets, began to already run out of office space, even though Gooderham built it only six years earlier and another one in 1892. At the close of the nineteenth century, it was fashionable for prominent businessmen to build grand structures symbolizing their influence over the city, and Gooderham followed suit. He purchased the Coffin Block and demolished the old hotel. The Flatiron was set in the style of Romanesque Revival, and aesthetically it bears a strong resemblance to Gooderham's residence at the northeast corner of St. George and Bloor Streets, now home to the York Club; both were designed by the same architect. The cost of the construction was $18,000, an astonishing number at that time. The building originally only had only three walls, as it was built onto the side south wall of the building directly behind it. Gooderham's office was located on the top floor, right under the cupola. From there, he had a commanding view of all of his business dealings: his ships at the harbour, his trains on the Esplanade, his employees at the bank, his distillery, and the King Edward Hotel, which was then under construction. In the late 1950s and the early 1960s, the building came to symbolize the efforts of the opposition of urban renewal. 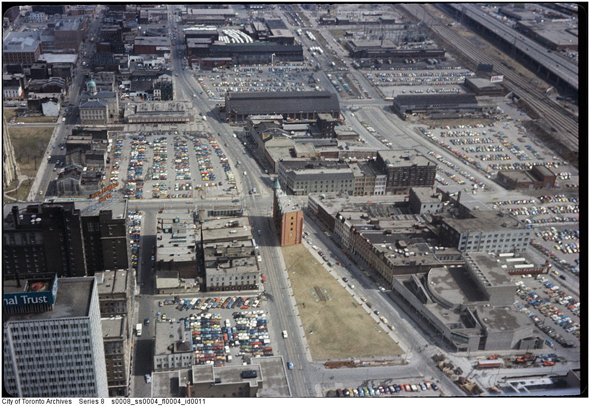 Photographs from the City of Toronto Archives show that many buildings in the vicinity of St. Lawrence Market were razed and replaced with parking. This included the bank building across the street and the building behind the Flatiron, but it managed to survive the destructive influence of the urban renewal mentality, which then was considered progressive. 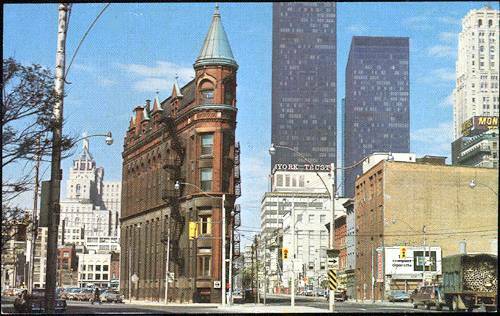 In 1957, the Gooderham estate sold the structure to Velco Investments. Finally, in 1973, it landed in the hands of David and Thomas Walsh at the cost of $600,000. By that time, the aging landmark was in need of a restoration, on which the owners spent half a million dollars and then rented it as office space. The same year, the building was listed in the City of Toronto Inventory of Heritage Inventory and designated as a heritage property two years later. Another renovation took place in 1998, when Michael and Anne Tippin bought the building and faithfully restored it, and the Flatiron continues to be of the city's most iconic landmarks. 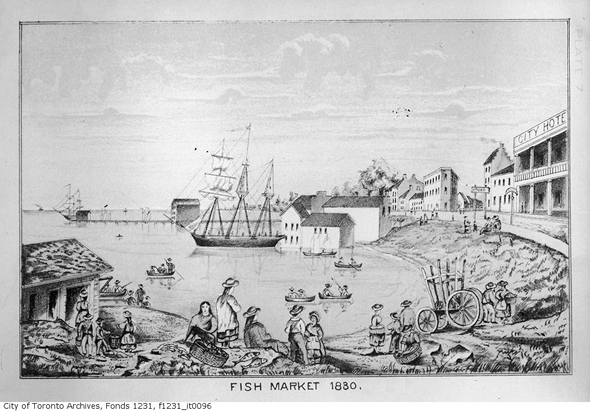 Images from the City of Toronto Archives and Wikimedia Commons.